PORT WASHINGTON, N.Y. – Adaptive, customizable landscape lighting is here—change color temperatures and adjust the lumen output of each luminous element in the field. WAC Landscape Lighting has upgraded its Hardscape Series of LED Luminaires, a rock solid solution for numerous applications. Lumen adjustment control allows you to adjust brightness in the field and you can easily switch color temperatures from warm for lighting granite to pure white for lighting bluestone. LED Hardscape allows the end-user or contractor to illuminate hardscapes of various materials and designs, to suit the customers’ needs and applications. 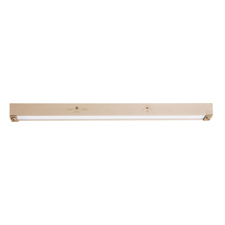 IP66 rated, these luminaires conveniently adapt into existing 12V Systems. A stainless steel masonry bracket and rotating clips help you get the perfect angle and eliminate glare. Hardscape is available in bronze, graphite and sand to complement a wide variety of stonework. Sizes range from three to 18 inches in length. WAC Lighting is a second-generation family owned and operated lighting company with a reputation for quality spanning over 30 years. With a history of inventing and making technology-leveraged innovation widely available to the market through the benefits of a world-class manufacturing facility. Headquartered in New York, WAC retains factories in New York, California, Georgia and China to support a fully vertically integrated research, design, engineering, electronics, fabrication, manufacturing and testing operation worldwide. WAC Landscape Lighting is an expansion of its lighting technology brand to offer groundbreaking new-patented solutions for landscape lighting. WAC Landscape Lighting can be reached at 1.800.526.2588 or by visiting www.waclandscapelighting.com.